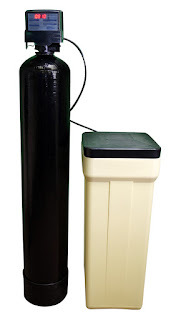 Clean Well Water Report: Can I Use a No-Salt Water Softener On Well Water? 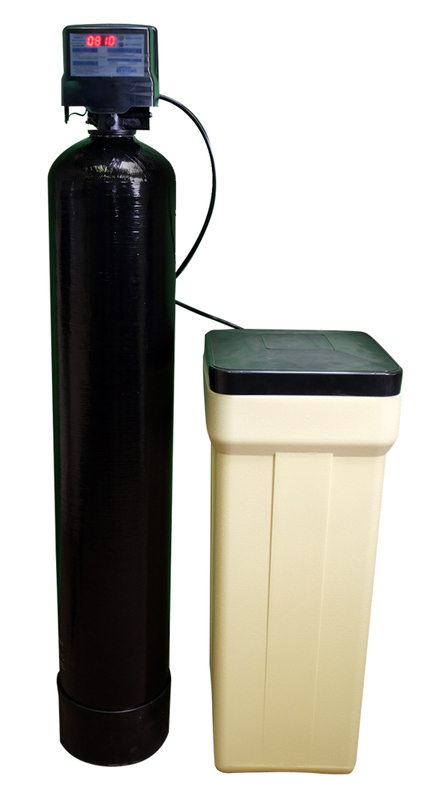 Can I Use a No-Salt Water Softener On Well Water? We use well water on our farm and our water is hard. No rust or much sediment, just clean hard well water. Will a no salt water softener remove this hardness? 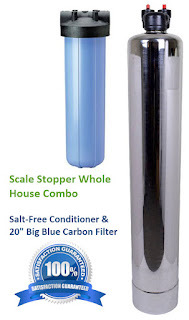 I am sick of cleaning our shower glass doors but my husband doesn’t want a water softener that uses salt. Thanks for emailing. I lived on a farm with very hard well water, our water was 40 grains/gallon hard. My wife used to say you could stand a spoon up in the glass by itself, it was so hard. I know how you feel when the water is very hard, it makes cleaning a chore. Water softeners remove hardness scale (calcium carbonate) from water so fixtures are mostly spot-free, glasses sparkle, skin is soft, laundry is clean and bright. They do require salt to operate. A salt-free conditioner keeps hardness scale from building up in pipes, water heaters, appliances, and extend the life of your plumbing, fixtures, and appliances. Little or no routine maintenance is required and they don’t use salt. A salt-free conditioner will work fine for many hard water conditions but definitely are not for everyone and every hard water condition! If you want spot-free shower doors, for example, it is best to use a salt type water softener, NOT a salt-free conditioner. If you have had a water softener and your water is greater than 10 – 12 grains per gallon, and you like soft water… you will likely not like a salt-free conditioner. If you see someone saying they have a “salt-free water softener”, it's technically incorrect. Softening removes the hardness ions, whereas no salt conditioners… do not. For softeners, we recommend the type that can meter and count the number of gallons you use in the home, and only regenerate and backwash when it is absolutely necessary. This saves salt and water. 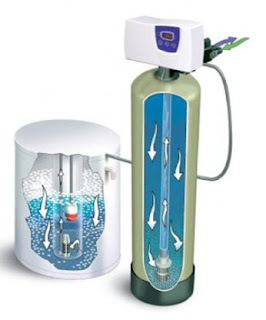 Before you begin selecting a water softener, you should first ask yourself whether you want to use a regular ion exchange water softener, which uses salt and physically removes hardness, or a salt-free water conditioner which does not use salt, but also doesn’t remove hardness and works best to keep scale from building up in pipes. Normal water softeners use ion-exchange media to remove hardness. An ion-exchange resin inside the softener attracts calcium and magnesium from the water and replaces them with sodium ions from the exchange resin. During regeneration (the process by which the softener’s resin is cleaned and kept ready for use) saltwater is drawn from a brine tank into the softener to regenerate the sodium in the resin. These systems will remove calcium and magnesium, thereby eliminating scale and making fixtures spot-free, clothes cleaner and brighter, and skin softer. In comparison, salt-free water conditioners produce a catalytic reaction to convert calcium and magnesium in water to firm calcite crystals which are then carried away by the water flow once they reach a sufficient size (the nanometer range). Thus, saltless water conditioners do not physically remove water hardness, but change the dissolved calcium carbonate into a type of calcite crystal that cannot attach to pipes or appliances to create hardness deposits. Salt-free conditioners also require less maintenance than normal softeners because they don’t need to be back-washed or regenerated – this makes them cheaper due to decreased water and energy usage and eliminates the need to replace the brine solution, further increasing your savings over a normal water softener. 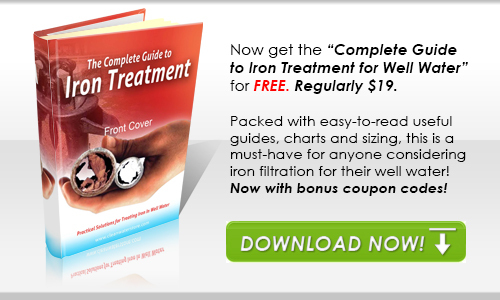 However, they can become fouled and ruined quickly if there are any iron, manganese, or sulfides in the water, so often they are not the best type for well water. How Do I Know Which Type to Use? Test your water first. If you have high hardness over 12 – 15 grains per gallon, get a water softener. If you only care about protecting your appliances, plumbing, and fixtures and having improved scale control, cleaner shower doors and glasses (but not totally spot-free) consider a salt free conditioner, as they save having to buy salt and are very easy to install and operate. The system recommended is fully automatic and uses the reliable 5900e control valve for dependable filtration with minimal maintenance requirements along with being quite user-friendly in operation. You can use the optional blue tooth and install our App will allow you to change and monitor the water softener over your phone or tablet. You can also use an optional Spindown filter which would be installed upstream of the water softener which will protect against sand/sediment from entering the control valve and cause unwanted problems. You can also use this to pour some bleach into and shock the filter/house with Chlorine or Peroxide from time to time whichwill help with odor buildup as well as improving the filters cleanliness. This uses a mesh screen thus no filter cartridges that need constant servicing. Simply flush the valve for 10 – 20 seconds as needed and done. This equipment is sized for your home as reported in having 2 bathrooms. Based upon the hardness levels of 250 mg/L (15 Grains per Gallon) this will regenerate about every 2,000 gallons. The following will show images, product links, as well as pricing on the equipment as recommended. Softener 5900BT Series- 32K Size, 1.0 cu. Ft.
Includes 1-inch pipe connectors; by-pass valve; 1.0 cubic feet of heavy-duty Softener resin; heavy-duty brine tank; and 5900e Series digital metered-regeneration control valve. 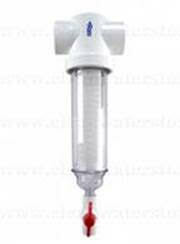 Ease of service along with a simple user interface is a big plus with this valve. Excellent quality and will last for years to come, typically 10+ as long as is backwashing normally and using the proper amount of salts. These are quite efficient with usage, this would only regenerate based upon the gallons used and not by days of the week. Dimensions: 9”x 48” Tank, with the valve, is approximately 55” tall. All instructions on assembly are included as is tech-support as well. Brine Tank is 13” X 13” x 33” Tall. Free Shipping Over $100: All quoted prices include shipping within the continental U.S. Dedicated Support: Our trained and certified water specialists are here to help if you have any questions. Our support and service are #1 in our industry.